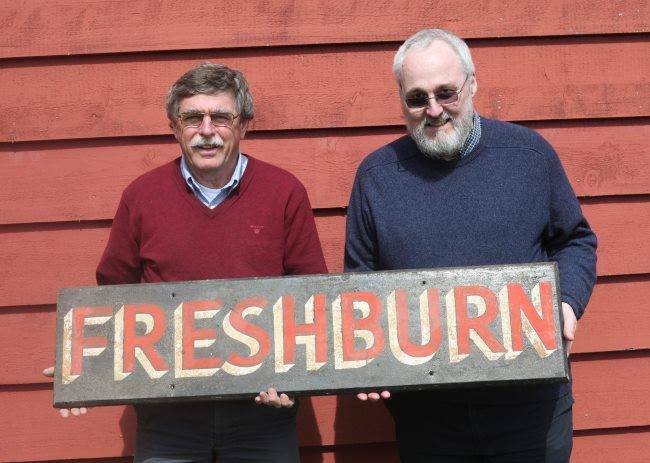 The picture shows the late Barry Smith on the right holding an original nameboard for Freshburn, which he sent for scrap in Holland, March 1982. Freshspring was the last of 14 'Fresh' class ships built by Lytham Shipbuilding & Engineering Co, Lytham between 1939 & 1947 for the Admiralty (Director of Stores) before being completed and taken over by the Royal Fleet Auxiliary (RFA) and latterly the Port Auxiliary Service (PAS). The other ships in the class were Freshwater, Freshet, Freshbrook, Freshener, Freshlake, Freshmere, Freshpool, Freshwell, Freshburn, Freshford, Freshtarn, Freshpond, Freshspray and Freshspring, of which Freshspring is the only survivor.